Mom Knows Best : Do You Like Things Hot And Spicy? When I cook I like to get hot and spicy. I like my food to be full of flavor and have a kick of heat. I don't want just a buring mouth when I eat spicy food, but rather a "oh my that tastes so good." Now when most people think of hot peppers, they think of jalapenos, but did you know there are so many different varieties and types of peppers? These peppers have many different heat levels and tastes. My favorite pepper is the green chile pepper and since it is grown here in New Mexico, I tend to eat a lot of it. While the green chile pepper has a nice heat to it, it does not have the flavor to it so I have to add other ingredients to it when I am cooking. So when I saw this Pepper of The Month Club, I just knew that I had to check it out. I love spicy flavorful food and I wanted to try some new flavors in my food. Since my husband loves spicy food too, I decided to get him the Pepper of The Month Club for a Christmas gift. My husband was thrilled to receive his first box, shortly after Christmas. Inside his box was three bottles of unique sauces, ranging in different heats. My husband got a kick out of the names on the bottles of sauces. Two of the sauces brand names were Captain AssJack and the other was Flamingo Fire. The pictures on the bottles were cool too. The box included a card with wonderful descriptions for each sauce so you knew what to expect with flavor and heat. The card also gave ideas on what to use the hot sauce on. I got a good laugh with the Flamingo Fire sauce description as it said that the sweet hot sauce was delicious on all foods, especially grilled gator, roasted possum and smoked snapping turtle. I have no clue where to even buy those kinds of meat, even if I wanted to eat them! My husband will be having fun cooking with these hot sauces. I just hope he doesn't expect me to buy him some gator meat. These sauces will bring some great flavor to our meals in the next month and by the time we finish with these sauces, my husband will get another shipment of three more bottles of hot sauces. 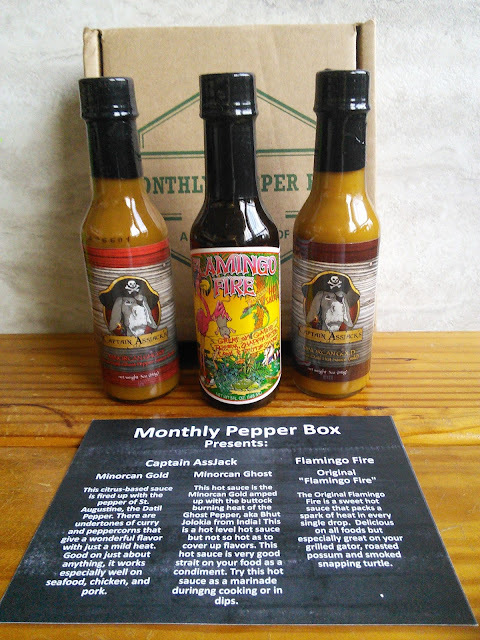 I bought him the three-month plan of the Monthly Pepper Box, but there are many different plans to choose from. The hot sauces will range from "mild" to "call the fire department" hot and each month features 3 distinct heat levels. 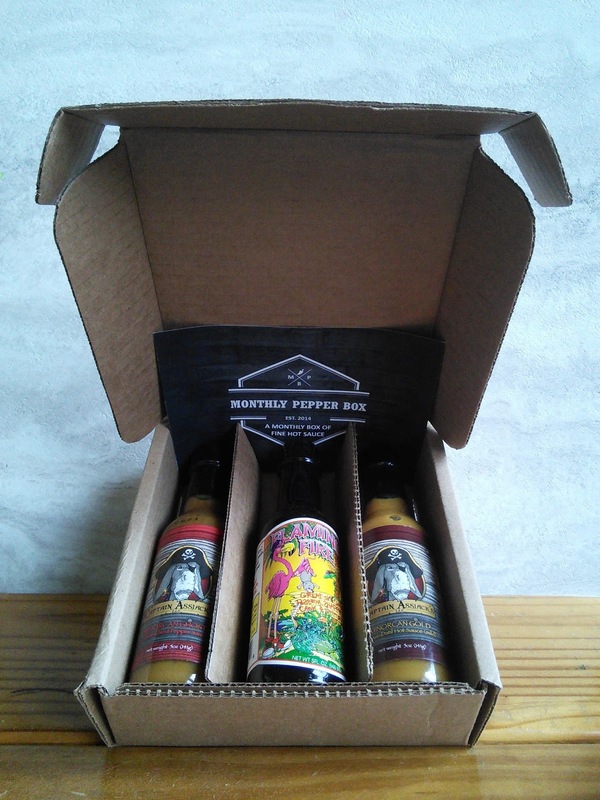 Check out the Monthy Pepper Box at the below link and see how you can make things hot and spicy in your kitchen. For me, the spicier the better. Not the case with my husband. I would love to try these! I want some flavor and not just the heat, too, in my sauce. Yes I do! I love spicy and tangy foods they are the best! I might be the only person on the face of the planet that hates spicy! LOL! Yes spicy is my favorite. I am pretty sure that I need to get this box! I love spicy food too! This is an awesome loot. I wish I had known about this box sooner. Thanks! Would love to try these. Love spicy foods. My husband would love this Pepper of the Month Club. I'll have to check it out. Thanks for sharing. I would love to try that! Especially the spice one. We love it hot and spicy at home. I would love to try these sauces. This box is definitely for me. I love both hot and spicy. It is simply amazing.